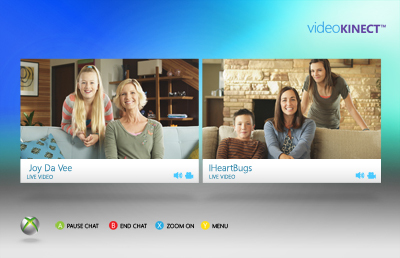 You can use Video Kinect to have live video chats with your Xbox Live friends. Go to Social, select Friends, select one of your friends, use the D-pad to go right, and then select Invite to Video Kinect. Press the Guide button, select Chat & IM, and then select Video Kinect. Go to Apps, select Browse Apps, select Social, and then select Video Kinect. Select Browse Apps, Social and then Video Kinect. Select More Friends and then find someone to chat with. You can chat with only one friend at a time. Select the message from your friend. Select Accept Video Kinect Invite to start chatting. Auto Zoom: tracks your movement and centres you on the screen (this is on by default). Kinect Guide: goes to the Kinect Guide. Pause: pauses the video chat. Cancel: cancels the video chat. "Xbox Live Gold Membership required"
Select Test Xbox Live Connection. If you experience a connection error, try using the Xbox Live Connection Error Solution. Video Kinect is smoothest when you have good room lighting. If the video is not smooth, try increasing your room lighting. Another possibility is that your Internet connection isn't fast enough. Video Kinect works best if you and your friend have a high-speed Internet connection (at least 540 kilobits per second or Kbps). For the best performance, an upload and download speed of 700 Kbps is recommended. See the Xbox Live Slow Performance Solution for help. If you're using a Kinect sensor to chat, make sure that you disconnect any wired or wireless headsets. Video Kinect works best if you and your friend have a high-speed Internet connection. If you are still having problems, see Troubleshoot problems with Xbox Live chat. Video Kinect can't be started if a profile subject to parental controls is signed into your console (child accounts are restricted from Video Kinect by default). To change online safety settings, see Xbox 360 online safety and privacy settings for child accounts. If your gamertag has an Xbox Live Gold Membership and you get this message, exit Video Kinect and try starting it again. You will only see Xbox Live friends when they are online. Do you have more than one Microsoft Account? If so, try signing in with your other account to see if your friends are associated with that account. If you want to change the Microsoft account associated with your gamertag, see Microsoft account support. Select each item in the list and then select Delete. Once the Video Kinect items have been deleted, go back to your Friends list. 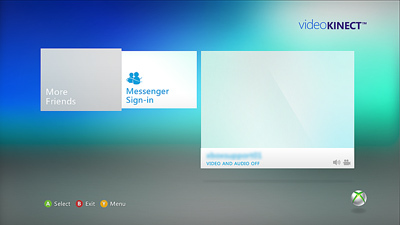 Select Invite to Video Kinect to download Video Kinect again. Would you like to contact Support regarding the "Video Kinect on Xbox 360" issue you were reading about or a different issue?